Received October 12, 2016; Accepted October 17, 2016.; Published online October 28, 2016. Plants have become physiologically adapted to a seasonally shifting environment by evolving many sensory mechanisms. Seasonal flowering is a good example of adaptation to local environmental demands and is crucial for maximizing reproductive fitness. Photoperiod and temperature are major environmental stimuli that control flowering through expression of a floral inducer, FLOWERING LOCUS T (FT) protein. Recent discoveries made using the model plant Arabidopsis thaliana have shown that the functions of photoreceptors are essential for the timing of FT gene induction, via modulation of the transcriptional activator CONSTANS (CO) at transcriptional and posttranslational levels in response to seasonal variations. The activation of FT transcription by the fine-tuned CO protein enables plants to switch from vegetative growth to flowering under inductive environmental conditions. The present review briefly summarizes our current understanding of the molecular mechanisms by which the information of environmental stimuli is sensed and transduced to trigger FT induction in leaves. Day length (= photoperiod) and ambient temperature undergo continual daily and seasonal changes. These fluctuations cause repeated environmental perturbation from year to year. Plants have developed sensory mechanisms to synchronize many biological events with their surroundings. In leaves, differences in photoperiod and temperature are perceived and used for the generation of a floral cue that is transmitted into the shoot apical meristem, where floral organs form (Song et al., 2013). Flowering time is coordinated with external environmental circumstances, including seasonal availability of animal pollinators, in order to maximize seed production (Hegland et al., 2009). Photoperiod and temperature are the major environmental factors that determine the timing of flowering (Andres and Coupland, 2012; Kim et al., 2009; Song et al., 2015). In crop plants, flowering during an appropriate season is a crucial aspect for food production. The molecular mechanisms underlying the influences of changes in photoperiod and temperature on flowering have been best characterized in the model plant Arabidopsis thaliana. Recent advances have revealed numerous regulatory components involved in the induction of a transmittable flowering signal in response to changes in photoperiod and temperature (Andres and Coupland, 2012; Song et al., 2013; 2015). Mechanistic regulation of the signal induction by photoperiod is relatively well defined (Andres and Coupland, 2012; Song et al., 2015). However, as most laboratories grow plants under constant temperature conditions, the effect of temperature fluctuations on flowering regulation is often underestimated or ignored. Because changes in day length occur in a predictable manner, plants mainly use photoperiodic information in order to anticipate upcoming seasonal variations (Thomas and Vince-Prue, 1996). Arabidopsis is a facultative long day plant that flowers early in long photoperiods compared to short photoperiods (Kobayashi and Weigel, 2007). In this phenomenon, the induction of FT expression plays the key role. Under constant warm temperature (?22°C) conditions, the abundance of FT transcripts is extremely low in short days (i.e., 8 h of light and 16 hours of dark), whereas it highly accumulates in long days (i.e., 16 h of light and 8 h of dark). The high abundance of FT transcripts subsequently accelerates the timing of flowering during inductive photoperiods (Su?rez-L?pez et al., 2001). This day length-dependent regulation of FT gene expression largely relies on the function of the CONSTANS (CO) protein, which acts as a transcriptional activator of the FT gene (Samach et al., 2000). The circadian clock regulation of CO transcription and the multiple effects of various photoreceptors on CO protein stability changes are crucial for the accumulation of CO protein under favorable conditions (Lazaro et al., 2015; Song et al., 2012b; 2015; Su?rez-L?pez et al., 2001; Valverde et al., 2004). Not only photoperiod but also ambient temperature changes largely contribute to FT transcription via the action of a large number of floral regulators, most of which are repressors (Andres and Coupland, 2012; Song et al., 2013). The amount of FT transcripts is reduced at low temperature but increased at high temperature even in short days (Fernandez et al., 2016; Kumar et al., 2012). This temperature-dependent FT expression can override the effect of photoperiod on the timing of flowering, preferentially in short days (Fernandez et al., 2016; Kumar et al., 2012). 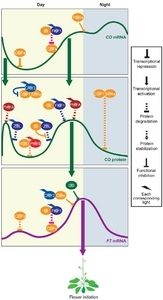 The present review mainly focuses on how the photoperiodic information is integrated into the induction of FT expression through the spatiotemporal manipulation of CO transcription and its protein abundance, and briefly discusses the possible effects of interactions between photoperiod and temperature on CO-mediated FT expression in Arabidopsis. Although a considerable number of floral regulators are involved in the processes described, not all will be considered. The interaction between the circadian clock and light specifies photoperiod information (Golembeski et al., 2014). Expression of the CO gene is controlled by the circadian clock that results in oscillation of its mRNA abundance throughout a day (Su?rez-L?pez et al., 2001). The mRNA abundance peaks at night and troughs in the morning under both short and long day conditions. The levels of CO transcripts remain very low during the day in short days; in contrast, these levels are high at the end of the day in long days, when light is still available (Su?rez-L?pez et al., 2001). Differences in day length-dependent CO transcript profiles during the light period are largely determined by amounts of the FLAVIN-BINDING, KELCH REPEAT, F-BOX 1 (FKF1)?GIGANTEA (GI) complex (Sawa et al., 2007). The formation of the FKF1-GI complex is light dependent and is important for relieving the repression of CO transcription mediated by the CYCLING DOF FACTOR (CDF) family of DOF domain transcription factors (Fornara et al., 2009; Sawa et al., 2007) (Fig. 1). The CDF family members (CDF1-CDF5) function as floral repressors (Fornara et al., 2009; Imaizumi et al., 2005). Among these, the expression of CDF1, CDF2, CDF3, and CDF5 genes, driven by the circadian clock, shows a similar diurnal profile, with high transcript levels during the late night and morning. The morning-enriched expression of these repressors strongly represses CO transcription in the morning via their association with the CO locus (Fornara et al., 2009; Sawa et al., 2007). The transcriptional repressor activity of the individual gene products is largely redundant and additive in the expression of CO (Fornara et al., 2009). Quadruple mutations in the CDF1, CDF2, CDF3, and CDF5 genes lead to high accumulation of CO transcripts in the morning as well as the rest of day, regardless of photoperiod, which makes Arabidopsis insensitive to changes in day length (Fornara et al., 2009). Hence, the cdf1 cdf2 cdf3 cdf5 quadruple mutant always flowers early under both long and short day conditions. Because the timing of changes in CDF abundance is a crucial aspect for day length sensing, daily fluctuations of their gene expressions are tightly regulated by multiple core clock proteins (Huang et al., 2012; Nakamichi et al., 2007; 2010). In the morning, CDF expression is probably induced by two morning components CIRCADIAN CLOCK ASSOCIATED 1 (CCA1) and LATE ELONGATED HYPOCOTYL (LHY) that are related Myb transcription factors (Nakamichi et al., 2007; Schaffer et al., 1998; Wang and Tobin, 1998). Conversely, the expression appears to be inhibited by the action of PSEUDO-RESPONSE REGULATOR (PRR) transcriptional repressor proteins, PRR5, PRR7, and PRR9, in the afternoon (Nakamichi et al., 2007). In addition to the transcriptional repression by PRR proteins, post-translational regulation is crucial for the day length-dependent rhythmic expression of the CO gene (Imaizumi et al., 2005). The CDF proteins are targeted for degradation by the role of the E3 ubiquitin ligase FKF1 protein that contains three functional domains, LOV (light, oxygen, or voltage), F-box, and KELCH repeats (Imaizumi et al., 2005; Song et al., 2013). The LOV domain is responsible for absorbing blue light and activating the FKF1 protein. The light-activated FKF1 interacts with GI through the LOV domain in a blue light-dependent manner (Sawa et al., 2007). The expression of FKF1 and GI genes are controlled by the circadian clock, and the abundance of the FKF1-GI complex differs between photoperiods (Fowler et al., 1999; Imaizumi et al., 2003; Sawa et al., 2007). GI protein abundance peaks at the end of the day, whereas FKF1 protein is mainly expressed in the dark in short days. This out-of-phase expression pattern of FKF1 and GI proteins causes a significant reduction in the complex formation between the two proteins (Sawa et al., 2007). No contribution of the FKF1-GI complex to the removal of CDF repression on CO transcription results in little CO protein accumulation and subsequently in extremely low FT transcript levels under light during short days (Sawa et al., 2007). In contrast, the diurnal protein profiles of FKF1 and GI largely overlap in long days. The peaks of FKF1 and GI abundance coincide in the late afternoon, enabling FKF1 to form a protein complex with GI and, simultaneously, to recognize the proteolytic substrates, the CDF proteins, through physical bindings via the KELCH repeat domain. The FKF1-GI complex then mediates the proteasome-dependent degradation of the CDF proteins through the F-box domain of FKF1, which results in the release of transcriptional repression of the CO locus (Sawa et al., 2007) (Fig. 1). This allows the CO gene to be expressed under these conditions, leading to the accumulation of CO proteins when daylight remains. Therefore, high FT transcription occurs at dusk and promotes flowering in long days (Fig. 1). The E3 ubiquitin ligase activity of FKF1 in long days restricts CDF repression on CO transcription to the morning (Imaizumi et al., 2005; Song et al., 2013). Upon the removal of CDF proteins from the CO promoter, transcriptional activators are able to gain access to the promoter. In the activation of CO transcription, four basic helix-loop-helix (bHLH) transcription factors, FLOWERING BHLH1 (FBH1), FBH2, FBH3, and FBH4, redundantly induce CO expression from afternoon to night (Fig. 1). FBH proteins bind directly to the CO locus, and binding activity is higher in the afternoon than in the morning (Ito et al., 2012). The fine-tuned temporal balance among repressors, activators, and the E3 ubiquitin ligase enables the pattern of CO gene expression to be repeated in a day length-dependent manner. Accordingly, plants can utilize the expression information to differentiate photoperiods for flowering time regulation. The abundance of CO transcripts peaks at night in both long and short days but the maximum FT expression occurs at dusk in long days (Su?rez-L?pez et al., 2001) (Fig. 1). These observations indicate that the post-translational regulation of CO protein plays another key role in the timing of FT activation under inductive conditions. CO protein abundance is very low throughout the entire day in short days, but dynamically fluctuates during the daytime and darkness in long days (Song et al., 2012b; Valverde et al., 2004). Light quality is an essential element for CO protein stability changes (Song et al., 2012b; Valverde et al., 2004). Blue and far-red light stabilize the CO protein, whereas red light destabilizes it (Valverde et al., 2004). In addition to red light, darkness manipulates CO stability through ubiquitin-dependent mechanisms (Jang et al., 2008) (Fig. 1). During the night, the RING-finger E3 ubiquitin ligase CONSTITUTIVE PHOTOMORPHOGENIC 1 (COP1) mediates the degradation of CO by forming protein complexes with the SUPPRESSOR OF PHYA-105 (SPA1) family members, SPA1, SPA3, and SPA4, regardless of photoperiod (Jang et al., 2008; Laubinger et al., 2006; Liu et al., 2008b). This COP1-SPA complex-mediated degradation of CO is restricted only at nighttime by the functions of the blue light photoreceptors cryptochromes (CRYs), mainly CRY2 (Zuo et al., 2011). Light-absorbed CRY2 binds to SPA1, and this binding enhances the interaction between CRY2 and COP1 in response to blue light, which in turn leads to suppression of COP1/SPA1 activity (Zuo et al., 2011). Since the abundance of CO transcripts in short days is low throughout the day and peaks in the middle of night, this COP1-SPA complex-mediated degradation of CO is a key feature for preventing flower initiation under non-inductive conditions. In long days, the multi-layered functions of photoreceptors generate a unique daily profile of CO protein by directly and indirectly regulating its stability at different times of the day (Lazaro et al., 2015; Song et al., 2012b; Valverde et al., 2004) (Fig. 1). The maxima of CO stabilization occur immediately after dawn with a narrow peak and around dusk with a relatively broad peak (Song et al., 2012b; Valverde et al., 2004). At least four types of photoreceptors are involved in the generation of the early morning peak. The function of the blue light photoreceptor CRY2 contributes to CO accumulation, which might be caused by the maximum induction of CO transcripts at the end of the night, by inhibiting COP1/SPA1 activity during the daytime (Valverde et al., 2004; Zuo et al., 2011). Furthermore, the far-red light photoreceptor Phytochrome A (PHYA) stabilizes CO protein via a currently undetermined mechanism under a low red to far-red (R:FR) ratio, around dawn and dusk (Kim et al., 2008; Valverde et al., 2004). CO protein abundance is rapidly and markedly decreased with the onset of daylight. The red light photoreceptor PHYB appears to trigger the degradation of CO protein under a high R:FR ratio, during the daytime period (Valverde et al., 2004). PHYB forms protein complexes with HIGH EXPRESSION OF OSMOTICALLY RESPONSIVE GENES 1 (HOS1), an E3 ubiquitin ligase, and CO. The red light-activated PHYB probably promotes the binding of HOS1 to CO, leading to the ubiquitin-dependent degradation of CO (Lazaro et al., 2012; 2015). Together with the concerted action of PHYB and HOS1, FKF1 relatives, ZEITLUPE (ZTL), and potentially LOV KELCH PROTEIN 2 (LKP2), interact with CO and destabilize it in a proteasome-dependent manner (Kim et al., 2007; Song et al., 2014). These destabilization mechanisms ensure that CO abundance is continually lowered until the afternoon of long days (Fig. 1). In contrast, CO proteins are highly accumulated near the end of the day via the activity of PHYA and FKF1. PHYA increases CO stability in response to a low R:FR ratio around dusk (Valverde et al., 2004). In addition to the regulation of CO transcription, FKF1 also enhances CO stability (Song et al., 2012b). FKF1 binds directly to CO protein through the LOV domain, and this binding is enhanced by blue light. Because, with the exception of FKF1 and ZTL, the protein expression of photoreceptors involved in CO stability changes is constant during the day, the FKF1-CO interaction is important for timely stabilization of CO in the late afternoon (Song et al., 2012b; 2014). Although the mechanism of CO stabilization mediated by FKF1 has yet to be fully elucidated, it appears that the GI protein plays a key role in this process. Two relative proteins, FKF1 and ZTL, play antagonistic roles in the modulation of CO stability (Song et al., 2014). These proteins bind to GI, and the formation of these protein complexes is most likely to be crucial for their functional status (Kim et al., 2007; Sawa et al., 2007). In the morning, the functionally active ZTL captures and destabilizes CO (Song et al., 2014). ZTL-mediated CO degradation is terminated when GI and FKF1 proteins are expressed. In the afternoon, ZTL interacts with GI in a blue light-dependent manner (Kim et al., 2007). The binding to GI renders ZTL nonfunctional, and in turn, CO is sequestered from ZTL. Thus, FKF1 forms a protein complex with GI at the same time. However, unlike ZTL, GI-bound FKF1 is functionally active and can still interact with other proteins such as CO and CDFs for stabilization and degradation, respectively (Sawa et al., 2007; Song et al., 2012b; 2014). Therefore, CO protein accumulation as a consequence of the activities of the FKF1-GI complex, CRY2, and PHYA largely contributes to the peak expression of the FT gene at dusk in long days, which stimulates floral initiation (Fig. 1). The roles of ZTL and LKP2 proteins in photoperiodic flowering regulation are complicated and need to be further investigated. Overexpression of ZTL or LKP2, unlike FKF1, delays flowering, and this could be attributable to the capture of FKF1 in the cytosol by the interactions of ZTL and LKP2 with FKF1 (Takase et al., 2011). However, the proteins simultaneously destabilize CO as well as, synergistically with FKF1, CDFs and, inversely, increase the stability of CIB (CRY-interacting basic helix-loop-helix) transcription factors (Fornara et al., 2009; Liu et al., 2013a), which are FT activators. Diverse external environmental signals and internal cues, age and hormones, converge on the regulation of FT transcription (Song et al., 2013). Many transcriptional repressors bind directly to specific cis-elements in the FT locus and hamper precocious flowering under non-inductive conditions (Andres and Coupland, 2012; Song et al., 2015). Among the repressors, the activity of CDF family members strongly prevents FT expression and counteracts functioning of the CO protein (Song et al., 2012b). CDF1 and probably other CDF proteins associate with FT promoter regions near the transcriptional start site, which overlap with the CO-responsive element (CORE) and the CIB-binding cis-element (Liu et al., 2013b; Song et al., 2012b; Tiwari et al., 2010). Similar to CO transcriptional regulation, the binding of CDFs to the FT promoter occurs in the morning under long days (Song et al., 2012b) (Fig. 1). Given that the induction of FT expression is CO protein abundance-dependent, a linear relationship is assumed to exist between CO stability and FT transcript levels. However, the repression activity of CDFs appears to ensure that FT expression is time-dependently regulated, leading to a unique daily expression profile. Accordingly, the abundance of FT transcripts in the morning remains low, even though the amount of CO protein peaks in wild-type plants and is substantially increased in the ztl mutant under these conditions (Song et al., 2012b; 2014; Valverde et al., 2004). The FT repression mediated by CDFs is alleviated in the afternoon. FKF1, most likely together with GI, stimulates the degradation of CDFs on the FT locus (Sawa and Kay, 2011; Song et al., 2012b) (Fig. 1). The binding activity of CDFs to the FT promoter region is antagonized by the presence of FKF1 (Song et al., 2012b). Thus, the action of GI on the microRNA pathway is implicated in the regulation of FT expression independently of CO transcription (Jung et al., 2007). Once CDFs are removed in the afternoon, two classes of activators of FT transcription are then able to gain access to the promoter (Fig. 1). A strong FT activator, CO protein, interacts with DNA-binding transcription factors, ASYMMETRIC LEAVES 1 (AS1) protein and CCAAT-box-binding nuclear factor Y (NF-Y) proteins (Cao et al., 2014; Kumimoto et al., 2010; Song et al., 2012a; Wenkel et al., 2006). Despite directly binding to the CORE in the FT promoter through the C-terminal CCT (CONSTANS, CONSTANS-like, and TOC1) domain, CO appears to be recruited to the FT promoter by the formation of protein complexes with the transcription factors (Song et al., 2015; Tiwari et al., 2010). Interestingly, the complex formed between CO and NF-Y proteins leads to the formation of long-distance chromatin loops, which connect distal enhancer elements to the proximal promoter elements. The timing of loop formation resembles the expression profile of the FT gene in long days (Cao et al., 2014). In addition, members of another activator family, comprising CIB1, CIB2, CIB4, and CIB5, redundantly and positively regulate FT transcription through binding to CRY2 in a blue light-dependent manner (Liu et al., 2008a; 2013b). The formation of heterodimer complexes between CIB1 and the other CIBs is important for the association with the non-canonical E-box element in the FT promoter (Liu et al., 2013b). In the leaf companion cells of Arabidopsis, after the completion of FT induction, FT protein, a long-sought flowering inducing substrate, is synthesized. The protein then travels from the leaf to the shoot apical meristem and triggers a transcriptional signaling cascade leading to flower initiation in long days (Corbesier et al., 2007; Pin and Nilsson, 2012). Temperature change independently acts as a strong flowering modulator and manipulates FT transcription in leaves (Fernandez et al., 2016; Kim et al., 2009; Kumar et al., 2012; Lee et al., 2007). In Arabidopsis, increased ambient temperature above the optimal range in short days causes the accumulation of FT transcripts late in the day and results in acceleration of flowering time under these conditions (Fernandez et al., 2016; Kumar et al., 2012). In contrast, decreased ambient temperature in long days down-regulates FT expression and delays flowering (Lee et al., 2007; 2013). In addition, a prolonged period of cold, like winter, enhances the de-repression of FT transcription, which is known as the vernalization response (Kim et al., 2009). Research on temperature-mediated flowering regulation has mainly focused on vernalization. However, the effect of ambient temperature on flowering (i.e., thermosensory flowering) has recently attracted attention due to the potential effects of global warming. In the thermosensory flowering pathway, the SHORT VEGETATIVE PHASE (SVP) protein functions to negatively control flowering (Lee et al., 2007; 2013). The protein associates with the FT locus and directly represses its transcription in response to low temperature (Fig. 2). Moreover, the role of the histone H2A variant H2A.Z is crucial for temperature-dependent FT expression (Kumar et al., 2012). The occupation of H2A.Z nucleosomes on the FT locus occurs under low temperature conditions, which results in FT repression. This repression is relieved at high temperature, which enhances the accessibility of transcription factors to the FT promoter (Fig. 2). Indeed, the binding of the PHYTOCHROME INTERACTING FACTOR 4 (PIF4) transcription factor to the FT promoter is increased in response to rising temperatures in short days (Kumar et al., 2012). PIF4 protein induces FT expression late in the day at high temperature in short days. The PIF4-mediated induction of FT transcription requires the activity of CO (Fernandez et al., 2016). CO abundance is very low in short days, and the peak expressions of PIF4 and CO proteins synchronize at dusk under these conditions (Fernandez et al., 2016; Song et al., 2012b; Valverde et al., 2004). High temperature under short days elevates CO abundance but not PIF4 amount. This allows CO and PIF4 to form a protein complex that contributes to the activation of FT transcription (Fernandez et al., 2016) (Fig. 2). In contrast, high temperature in long days up-regulates FT expression by increasing PIF4 protein levels, but without changing CO (Seaton et al., 2015). FLC protein plays the key role in the vernalization pathway. FLC is a transcriptional repressor and strongly reduces FT expression under non-inductive conditions (Andres and Coupland, 2012; Kim et al., 2009). Vernalization regulates chromatin states at the FLC locus and facilitates the removal of FLC repression on FT transcription in the spring (Fig. 2). In contrast to vernalization, a short-term cold treatment seems to repress FT expression. HOS1 mediates cold temperature-dependent FT repression through destabilization of the CO protein (Jung et al., 2012). Discrepancies in flowering time between field experiments and corresponding laboratory experiments indicate the importance of daily temperature fluctuations (Wilczek et al., 2009). In particular, the repression activity of FLC is considerably weakened in fluctuating temperature environments (Burghardt et al., 2016). Thus, importantly, the effect of temperature fluctuations on flowering appears to be substantially photoperiod-dependent (Fig. 2) (Burghardt et al., 2016; Kinmonth-Schultz et al., 2016). The gene expression profile of FT is markedly influenced by warmer day/cooler night cycles in long days but not in short days (Kinmonth-Schultz et al., 2016). FT abundance is reduced at dusk but increases at night. This alteration is closely correlated with the robust enhancement of CO transcription by FBH proteins and a subsequent increase in CO protein abundance during the cooler night. Moreover, the SVP protein functions to repress FT expression at dusk under these conditions, without changing the protein amount (Kinmonth-Schultz et al., 2016) (Fig. 2). The mechanism underlying ambient temperature-mediated flowering regulation remains to be elucidated. Nevertheless, given the importance of the effects of global temperature changes on plant development, including flowering (Craufurd and Wheeler, 2009; Fitter and Fitter, 2002), we have to consider employing natural temperature conditions in the laboratory in order to more precisely predict future scenarios of flowering time under conditions of changing environments. Since photoperiod sensitivity is an important feature for crop adaptation to climate changes (Craufurd and Wheeler, 2009), understanding the combinational effect of photoperiod and temperature on flowering is critical. The transition from vegetative phase to reproductive phase is the most dramatic change in the life span of many organisms and is an irreversible process in most plant species (Kobayashi and Weigel, 2007). Therefore, the timing of this phase transition must be precisely controlled. 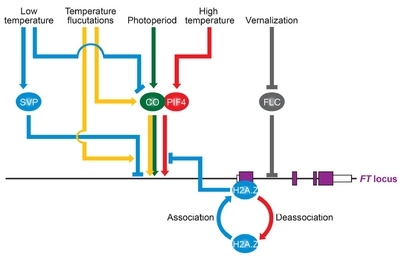 The sophisticated networks underlying photoperiod- and temperature-mediated signaling enable plants to align the transition with favorable conditions. This review discusses the regulation of FT expression by the activity of CO protein as a useful output tool to measure the effect of photoperiod and temperature fluctuations on the timing of flowering in Arabidopsis. Because the CO-FT regulon is highly conserved across the plant kingdom, including major crop species (rice, wheat, and barley) (Song et al., 2010; 2015), understanding the molecular mechanisms by which Arabidopsis incorporates the information of photoperiod and temperature fluctuations to generate floral signals might give us new insights into agricultural applications. Supposedly, agricultural traits obtained under environmentally controlled growth conditions are often overestimated and disappear in outdoor fields. In addition, the rising ambient temperature and increased environmental variability that are inherent in global climate change have already altered the reproductive phenology of plants (Craufurd and Wheeler, 2009; Fitter and Fitter, 2002). As the output of temperature-mediated flowering is gated reasonably well by the modulation of photoperiodic signaling components, studies on the interactive effects of these natural environmental factors are necessary for future crop security. Fig. 1. Photoperiodic flowering regulation by the induction of FT expression under long-day conditions. In Arabidopsis, a high abundance of CDF proteins accumulates and represses the expression CO and FT genes simultaneously by binding to promoter regions of these genes in the morning. FKF1 protein, the expression of which coincides with that of GI in the afternoon, absorbs blue light and forms a protein complex with GI. The protein complex stimulates the degradation of CDF proteins on CO and FT promoters. Removal of CDF repression enables FBH transcription factors to gain access to the CO promoter. FBH proteins activate CO transcription throughout the rest of day. CO protein is post-translationally modulated by light quality. The protein is degraded by the COP1?SPAs complex in the dark, but is sequestered from the complex by the inhibitory function of blue light-activated CRY2. In the morning, CO is stabilized by the far-red light photoreceptor PHYA and immediately destabilized by the blue light photoreceptor ZTL and the formation of a protein complex between HOS1 and red light-absorbed PHYB. In the afternoon, CO accumulates as a consequence of the activities of FKF1, GI, and PHYA. Together with GI, blue light activation of FKF1 increases CO stability. Thus, GI indirectly regulates CO stability via the inhibition of ZTL function. In turn, FT expression is induced by CO and CIBs. CO binds to the FT promoter directly as well as indirectly with other transcription factors. In addition, CIB proteins interact with blue light-activated CRY2 and directly bind to the FT promoter. These CO and CIBs activate FT transcription at dusk, leading to the promotion of reproductive transition in long days. Fig. 2. The effect of temperature changes on FT induction. FLC, a strong floral regulator, associates with the first intron of the FT gene and represses the expression of the gene. Vernalization removes FLC repression of the FT locus. In short days, low temperature (?16°C) increases the occupancy of H2A.Z nucleosomes on the FT locus, resulting in the inhibition of PIF4 binding to the FT promoter under this condition. However, high temperature (?27°C) stimulates the de-association of H2A.Z from the FT locus and induces CO accumulation in the afternoon. These cause the formation of a CO-PIF4 complex that binds to the FT promoter and activates its transcription. SVP represses FT expression by binding to the FT promoter in response to low temperature in long days. Temperature fluctuations increase SVP activity at dusk and CO stability, which are also regulated by photoperiod, at night in long days, leading to changes in the gene expression profiles of FT in a day length-dependent manner. Andres, F., and Coupland, G. (2012). The genetic basis of flowering responses to seasonal cues. Nat. Rev. Genet.. 13, 627-639. Burghardt, L.T., Runcie, D.E., Wilczek, A.M., Cooper, M.D., Roe, J.L., Welch, S.M., and Schmitt, J. (2016). Fluctuating, warm temperatures decrease the effect of a key floral repressor on flowering time in Arabidopsis thaliana. New Phytol.. 210, 564-576. Cao, S., Kumimoto, R.W., Gnesutta, N., Calogero, A.M., Mantovani, R., and Holt, B.F. (2014). A distal CCAAT/NUCLEAR FACTOR Y complex promotes chromatin looping at the FLOWERING LOCUS T promoter and regulates the timing of flowering in Arabidopsis. Plant Cell. 26, 1009-1017. Corbesier, L., Vincent, C., Jang, S., Fornara, F., Fan, Q., Searle, I., Giakountis, A., Farrona, S., Gissot, L., and Turnbull, C. (2007). FT protein movement contributes to long-distance signaling in floral induction of Arabidopsis. Science. 316, 1030-1033. Craufurd, P.Q., and Wheeler, T.R. (2009). Climate change and the flowering time of annual crops. J. Exp. Bot.. 60, 2529-2539. Fernandez, V., Takahashi, Y., Le Gourrierec, J., and Coupland, G. (2016). Photoperiodic and thermosensory pathways interact through CONSTANS to promote flowering at high temperature under short days. Plant J.. 86, 426-440. Fitter, A.H., and Fitter, R.S. (2002). Rapid changes in flowering time in British plants. Science. 296, 1689-1691. Fornara, F., Panigrahi, K.C., Gissot, L., Sauerbrunn, N., R?hl, M., Jarillo, J.A., and Coupland, G. (2009). Arabidopsis DOF transcription factors act redundantly to reduce CONSTANS expression and are essential for a photoperiodic flowering response. Dev Cell. 17, 75-86. Fowler, S., Lee, K., Onouchi, H., Samach, A., Richardson, K., Morris, B., Coupland, G., and Putterill, J. (1999). GIGANTEA: a circadian clock-controlled gene that regulates photoperiodic flowering in Arabidopsis and encodes a protein with several possible membrane-spanning domains. EMBO J.. 18, 4679-4688. Golembeski, G.S., Kinmonth-Schultz, H.A., Song, Y.H., and Imaizumi, T. (2014). Photoperiodic flowering regulation in Arabidopsis thaliana. Adv. Bot. Res.. 72, 1-28. Hegland, S.J., Nielsen, A., Lazaro, A., Bjerknes, A.L., and Totland, O. (2009). How does climate warming affect plant-pollinator interactions?. Ecol. Lett.. 12, 184-195. Huang, W., Perez-Garcia, P., Pokhilko, A., Millar, A.J., Antoshechkin, I., Riechmann, J.L., and Mas, P. (2012). Mapping the core of the Arabidopsis circadian clock defines the network structure of the oscillator. Science. 336, 75-79. Imaizumi, T., Tran, H.G., Swartz, T.E., Briggs, W.R., and Kay, S.A. (2003). FKF1 is essential for photoperiodic-specific light signalling in Arabidopsis. Nature. 426, 302-306. Imaizumi, T., Schultz, T.F., Harmon, F.G., Ho, L.A., and Kay, S.A. (2005). FKF1 F-box protein mediates cyclic degradation of a repressor of CONSTANS in Arabidopsis. Science. 309, 293-297. Ito, S., Song, Y.H., Josephson-Day, A.R., Miller, R.J., Breton, G., Olmstead, R.G., and Imaizumi, T. (2012). FLOWERING BHLH transcriptional activators control expression of the photoperiodic flowering regulator CONSTANS in Arabidopsis. Proc. Natl. Acad. Sci USA. 109, 3582-3587. Jang, S., Marchal, V., Panigrahi, K.C., Wenkel, S., Soppe, W., Deng, X.W., Valverde, F., and Coupland, G. (2008). Arabidopsis COP1 shapes the temporal pattern of CO accumulation conferring a photoperiodic flowering response. EMBO J.. 27, 1277-1288. Jung, J.H., Seo, Y.H., Seo, P.J., Reyes, J.L., Yun, J., Chua, N.H., and Park, C.M. (2007). The GIGANTEA-regulated microRNA172 mediates photoperiodic flowering independent of CONSTANS in Arabidopsis. The Plant Cell. 19, 2736-2748. Jung, J.H., Seo, P.J., and Park, C.M. (2012). The E3 Ubiquitin Ligase HOS1 Regulates Arabidopsis Flowering by Mediating CONSTANS Degradation Under Cold Stress. J. Biol. Chem.. 287, 43277-43287. Kim, W.Y., Fujiwara, S., Suh, S.S., Kim, J., Kim, Y., Han, L., David, K., Putterill, J., Nam, H.G., and Somers, D.E. (2007). ZEITLUPE is a circadian photoreceptor stabilized by GIGANTEA in blue light. Nature. 449, 356-360. Kim, S.Y., Yu, X., and Michaels, S.D. (2008). Regulation of CONSTANS and FLOWERING LOCUS T expression in response to changing light quality. Plant physiol.. 148, 269-279. Kim, D.H., Doyle, M.R., Sung, S., and Amasino, R.M. (2009). Vernalization: winter and the timing of flowering in plants. Annu. Rev. Cell Dev. Biol.. 25, 277-299. Kinmonth-Schultz, H.A., Tong, X., Lee, J., Song, Y.H., Ito, S., Kim, S.H., and Imaizumi, T. (2016). Cool night-time temperatures induce the expression of CONSTANS and FLOWERING LOCUS T to regulate flowering in Arabidopsis. New Phytol.. 211, 208-224. Kobayashi, Y., and Weigel, D. (2007). Move on up, it’s time for change--mobile signals controlling photoperiod-dependent flowering. Genes Dev.. 21, 2371-2384. Kumar, S.V., Lucyshyn, D., Jaeger, K.E., Alos, E., Alvey, E., Harberd, N.P., and Wigge, P.A. (2012). Transcription factor PIF4 controls the thermosensory activation of flowering. Nature. 484, 242-245. Kumimoto, R.W., Zhang, Y., Siefers, N., and Holt, B.F. (2010). NF-YC3, NF-YC4 and NF-YC9 are required for CONSTANS-mediated, photoperiod-dependent flowering in Arabidopsis thaliana. Plant J.. 63, 379-391. Laubinger, S., Marchal, V., Gentilhomme, J., Wenkel, S., Adrian, J., Jang, S., Kulajta, C., Braun, H., Coupland, G., and Hoecker, U. (2006). Arabidopsis SPA proteins regulate photoperiodic flowering and interact with the floral inducer CONSTANS to regulate its stability. Development. 133, 3213-3222. Lazaro, A., Valverde, F., Pineiro, M., and Jarillo, J.A. (2012). The Arabidopsis E3 ubiquitin ligase HOS1 negatively regulates CONSTANS abundance in the photoperiodic control of flowering. Plant Cell. 24, 982-999. Lazaro, A., Mouriz, A., Pineiro, M., and Jarillo, J.A. (2015). Red Light-Mediated Degradation of CONSTANS by the E3 Ubiquitin Ligase HOS1 Regulates Photoperiodic Flowering in Arabidopsis. Plant Cell. 27, 2437-2454. Lee, J.H., Yoo, S.J., Park, S.H., Hwang, I., Lee, J.S., and Ahn, J.H. (2007). Role of SVP in the control of flowering time by ambient temperature in Arabidopsis. Genes Dev.. 21, 397-402. Lee, J.H., Ryu, H.S., Chung, K.S., Pose, D., Kim, S., Schmid, M., and Ahn, J.H. (2013). Regulation of temperature-responsive flowering by MADS-box transcription factor repressors. Science. 342, 628-632. Liu, H., Yu, X., Li, K., Klejnot, J., Yang, H., Lisiero, D., and Lin, C. (2008a). Photoexcited CRY2 interacts with CIB1 to regulate transcription and floral initiation in Arabidopsis. Science. 322, 1535-1539. Liu, L.J., Zhang, Y.C., Li, Q.H., Sang, Y., Mao, J., Lian, H.L., Wang, L., and Yang, H.Q. (2008b). COP1-mediated ubiquitination of CONSTANS is implicated in cryptochrome regulation of flowering in Arabidopsis. The Plant Cell. 20, 292-306. Liu, H., Wang, Q., Liu, Y., Zhao, X., Imaizumi, T., Somers, D.E., Tobin, E.M., and Lin, C. (2013a). Arabidopsis CRY2 and ZTL mediate blue-light regulation of the transcription factor CIB1 by distinct mechanisms. Proc. Natl. Acad. Sci USA. 110, 17582-17587. Liu, Y., Li, X., Li, K., Liu, H., and Lin, C. (2013b). Multiple bHLH proteins form heterodimers to mediate CRY2-dependent regulation of flowering-time in Arabidopsis. PLoS Genet. 9, e1003861. Nakamichi, N., Kita, M., Niimura, K., Ito, S., Yamashino, T., Mizoguchi, T., and Mizuno, T. (2007). Arabidopsis clock-associated pseudo-response Regulators PRR9, PRR7 and PRR5 coordinately and positively regulate flowering time through the canonical CONSTANS-dependent photoperiodic pathway. Plant Cell Physiol.. 48, 822-832. Nakamichi, N., Kiba, T., Henriques, R., Mizuno, T., Chua, N.H., and Sakakibara, H. (2010). PSEUDO-RESPONSE REGULATORS 9, 7, and 5 are transcriptional repressors in the arabidopsis circadian clock. Plant Cell. 22, 594-605. Pin, P.A., and Nilsson, O. (2012). The multifaceted roles of FLOWERING LOCUS T in plant development. Plant Cell Environ.. 35, 1742-1755. Samach, A., Onouchi, H., Gold, S.E., Ditta, G.S., Schwarz-Sommer, Z., Yanofsky, M.F., and Coupland, G. (2000). Distinct roles of CONSTANS target genes in reproductive development of Arabidopsis. Science. 288, 1613-1616. Sawa, M., and Kay, S.A. (2011). GIGANTEA directly activates Flowering Locus T in Arabidopsis thaliana. Proc. Natl. Acad. Sci USA. 108, 11698-11703. Sawa, M., Nusinow, D.A., Kay, S.A., and Imaizumi, T. (2007). FKF1 and GIGANTEA complex formation is required for day-length measurement in Arabidopsis. Science. 318, 261-265. Schaffer, R., Ramsay, N., Samach, A., Corden, S., Putterill, J., Carre, I.A., and Coupland, G. (1998). The late elongated hypocotyl mutation of Arabidopsis disrupts circadian rhythms and the photoperiodic control of flowering. Cell. 93, 1219-1229. Seaton, D.D., Smith, R.W., Song, Y.H., MacGregor, D.R., Stewart, K., Steel, G., Foreman, J., Penfield, S., Imaizumi, T., and Millar, A.J. (2015). Linked circadian outputs control elongation growth and flowering in response to photoperiod and temperature. Mol. Syst. Biol.. 11, 776. Song, Y.H., Ito, S., and Imaizumi, T. (2010). Similarities in the circadian clock and photoperiodism in plants. Curr. Opin. Plant Biol.. 13, 594-603. Song, Y.H., Lee, I., Lee, S.Y., Imaizumi, T., and Hong, J.C. (2012a). CONSTANS and ASYMMETRIC LEAVES 1 complex is involved in the induction of FLOWERING LOCUS T in photoperiodic flowering in Arabidopsis. Plant J.. 69, 332-342. Song, Y.H., Smith, R.W., To, B.J., Millar, A.J., and Imaizumi, T. (2012b). FKF1 conveys timing information for CONSTANS stabilization in photoperiodic flowering. Science. 336, 1045-1049. Song, Y.H., Ito, S., and Imaizumi, T. (2013). Flowering time regulation: photoperiod- and temperature-sensing in leaves. Trends Plant Sci.. 18, 575-583. Song, Y.H., Estrada, D.A., Johnson, R.S., Kim, S.K., Lee, S.Y., MacCoss, M.J., and Imaizumi, T. (2014). Distinct roles of FKF1, Gigantea, and Zeitlupe proteins in the regulation of Constans stability in Arabidopsis photoperiodic flowering. Proc. Natl. Acad. Sci USA. 111, 17672-17677. Song, Y.H., Shim, J.S., Kinmonth-Schultz, H.A., and Imaizumi, T. (2015). Photoperiodic flowering: time measurement mechanisms in leaves. Annu. Rev. Plant Biol.. 66, 441-464. Su?rez-L?pez, P., Wheatley, K., Robson, F., Onouchi, H., Valverde, F., and Coupland, G. (2001). CONSTANS mediates between the circadian clock and the control of flowering in Arabidopsis. Nature. 410, 1116-1120. Takase, T., Nishiyama, Y., Tanihigashi, H., Ogura, Y., Miyazaki, Y., Yamada, Y., and Kiyosue, T. (2011). LOV KELCH PROTEIN2 and ZEITLUPE repress Arabidopsis photoperiodic flowering under non-inductive conditions, dependent on FLAVIN-BINDING KELCH REPEAT F-BOX1. Plant J.. 67, 608-621. Tiwari, S.B., Shen, Y., Chang, H.C., Hou, Y., Harris, A., Ma, S.F., McPartland, M., Hymus, G.J., Adam, L., and Marion, C. (2010). The flowering time regulator CONSTANS is recruited to the FLOWERING LOCUS T promoter via a unique cis-element. New Phytol.. 187, 57-66. Valverde, F., Mouradov, A., Soppe, W., Ravenscroft, D., Samach, A., and Coupland, G. (2004). Photoreceptor regulation of CONSTANS protein in photoperiodic flowering. Science. 303, 1003-1006. Wang, Z.Y., and Tobin, E.M. (1998). Constitutive expression of the CIRCADIAN CLOCK ASSOCIATED 1 (CCA1) gene disrupts circadian rhythms and suppresses its own expression. Cell. 93, 1207-1217. Wenkel, S., Turck, F., Singer, K., Gissot, L., Le Gourrierec, J., Samach, A., and Coupland, G. (2006). CONSTANS and the CCAAT box binding complex share a functionally important domain and interact to regulate flowering of Arabidopsis. The Plant Cell. 18, 2971-2984. Wilczek, A.M., Roe, J.L., Knapp, M.C., Cooper, M.D., Lopez-Gallego, C., Martin, L.J., Muir, C.D., Sim, S., Walker, A., and Anderson, J. (2009). Effects of genetic perturbation on seasonal life history plasticity. Science. 323, 930-934. Zuo, Z., Liu, H., Liu, B., Liu, X., and Lin, C. (2011). Blue light-dependent interaction of CRY2 with SPA1 regulates COP1 activity and floral initiation in Arabidopsis. Curr. Biol.. 21, 841-847.